Hello and Welcome to Taylored Expressions February new release. Today is sneak peek day #1. This release is everything Spring and Easter! Who is ready for Spring? I am ready for Autumn actually. lol! I live in the Southern Hemisphere and I had enough of summer. I want some cooler weather 🙂 But for everyone who live in Northern Hemisphere, you should be longing for your Spring weather right? This release from Taylored Expressions will definitely bring in that Spring you have been waiting for. Plenty of easter sets as well. So are you ready for the sneak peek? 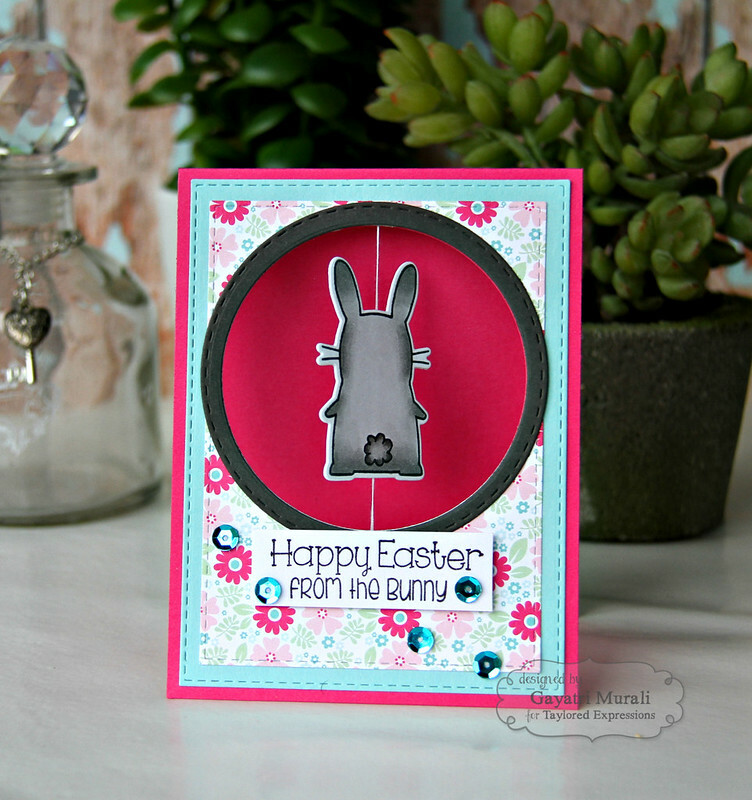 I am showcasing If Bunnies Could Talk stamp set and coordinating dies. This set is special because of two things. First,the front and back shape of the bunny match back to back. Secondly there are various faces to the bunny you can use. What a clever idea? I love that option. So many different bunnies with just one main image but then just change the faces. Then there are so many elements that can be added to the bunny to make each bunny different from the other. Finally there are four sentiments in the set. In my opinion, this set is must have Easter set in your collection. 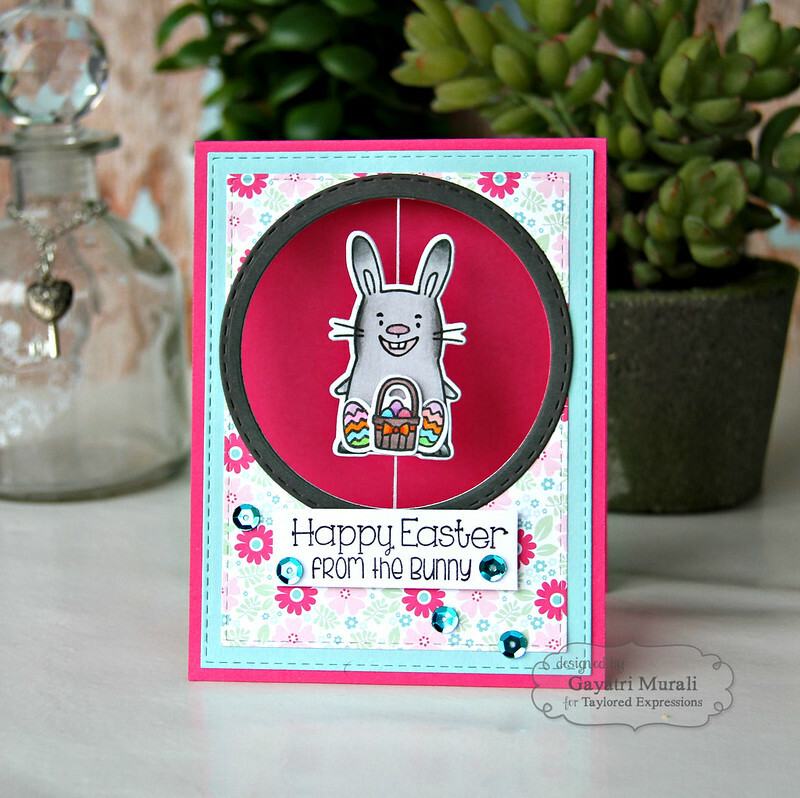 I took advantage of the matching shape of the front and back bunny to create a spinner card. I have been wanting to make one for a very long time. Love the interactive element on the suspension spinner card. I stamped and coloured the bunny, pondered which face to use (lol!) then picked the smiling face. I wanted the bunny to look happy. I also coloured the basket and couple of tiny eggs. I die cut all of them using the coordinating dies. To the front die cut of the bunny, I attached the basket and eggs. I then adhered the front and back of the bunny with a long string threaded through the middle. This makes the spinner element. So cute! The base of the card is Lollipop cardstock from Taylored Expressions. I die cut a circle in the top centre of the card front using the second largest stitched circle die from Stitched Circle Stacklet. I then die cut two rectangle panels. One using Sprinkles cardstock and the other pattern paper from Hello Happiness 6×6 pattern paper pack. So I used the largest rectangle die from Stitched Rectangle Stacklets for the blue panel and the second largest die for the pattern paper panel. I layered glued them. Then ran the same circle die I used on the card front to die cut a circle on the layered rectangle panel. I also die cut a circular frame using two stitched circle dies and Poppy Seed cardstock. To assemble the card, I placed the bunny right in the middle of the negative circle on the card front with strings pulled tight up and down the circle. I attached the strings with string scor tape. Then I adhered the layered rectangle panels on the card front making sure the circles coordinate. Finally the circular frame. The string hanging on either side of the panel is trimmed off. Now spin the bunny and let go, the bunny spins back. So cool! I simply stamped the sentiment also from If Bunny Could Talk stamp set on a strip of white cardstock and adhered below the spinner element. Finally embellished with sequins from Rainbow Bright sequins. I love the interactive element of this card. There are more stamp sets and dies sneak peeked today. Head over to Taylored Expressions Blog to see them all and also inspiration from many Taylored Expression designers. Taylored Expression is celebrating Release Week with some fabulous giveaways! Visit Taylored Expressions Blog each sneak peek day this week for all the details on how to enter to win. Too cute & so creative!